Manchester United supporter Andrew Kilduff unveils the message of love which fans will display at the Europa League final in Stockholm. Jose Mourinho says Marcus Rashford's free kick in last night's match was no fluke but the result of practice in training. The 19-year-old striker's goal gave Manchester United the lead in their Europa League semi-final against Celta Vigo. The stunning free kick also secured a precious away goal for United as they go into second leg at Old Trafford on Thursday. Manchester United will host Anderlecht at Old Trafford tonight in the second leg of the Europa League quarter final. United have the upper hand after scoring an away goal in Belgium last week when the first leg ended in a one all draw. A Liverpool FC fan who killed his best friend with one punch after the team lost in the Europa League final has been jailed for 28 months. Police have released CCTV images of two men who got into the Liverpool FC office and made off with Europa league cup final tickets. Dynamo Kiev have been ordered to close part of their stadium for next month's Europa League quarter-final after racist behaviour by fans towards Everton players. The Ukrainian side has also been fined 15,000 euros (#10,950) by UEFA for the setting off of fireworks and for insufficient organisation. The racist behaviour took place during the 5-2 second-leg win over Everton on March 19. UEFA has ordered partial closure of the NSK Olimpiyskiy stadium for the first leg of the quarter-final against Fiorentina, to be played in Kiev on April 16. The CEDB (UEFA Control, Ethics and Disciplinary Body) has ordered the partial closure of the NSK Olimpiyskiy stadium during the next UEFA competition match which FC Dynamo Kyiv would play as the host club, and in particular, Blocks 43 and 45 of the stadium. The Ukrainian club have also been fined 15,000 euros for the setting off of fireworks and the insufficient organisation. 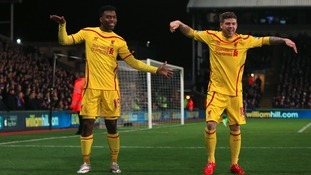 Liverpool striker Daniel Sturridge is excited to be back playing for Liverpool after a five month injury period. French football hooligan who attacked Everton fans is jailed. A French football hooligan who was among those who attacked Everton fans has been jailed. Up to 100 louts descended on Blues supporters in Lille on Wednesday night beating them and attacking them with metal chairs. A suspect - known only as Tomasz S - was arrested on Thursday after being recognised by police. The 30-year-old appeared in court on Friday where he admitted punching an Everton fan but claimed he acted in self-defence. However, a judge rejected that assertion and jailed him immediately for eight months. Everton FC say they will continue to work closely with French and Merseyside Police, in order to better understand two 'serious incidents' that occurred in Lille ahead of their Europa League fixture. "The incident in the city's main square quickly escalated into unwelcome and unpleasant scenes. Events then, equally quickly, returned back to normal with well-mannered and good-natured celebrations that were evident throughout the Club's stay in Lille. The Club will now work with all authorities to find out what happened and why." Everton are now providing an online feedback form where fans will be able to submit their evidence.